Farming Futures Video Slot Guide & Review - Casino Answers! Farming Futures is an incredible 7 reel slot machine which is found at casinos that utilize the Vegas Technology gaming software. Casinos that use the Vegas Technology software and this play host to this 7 reel slot include Millionaire Casino and VIP Slots Casino. The Farming Futures 7-reel slot machine is a very simple game to play, although can be a bit overwhelming at first due to the amount of reels. The minimum you can bet on the 7 reel slot machine is $0.01. The maximum credit you can bet is $10, however you can bet up to 9 credits per spin, so you can bet a high roller value of $90 per spin. The farmer symbol is the best one to get. If you get that on all 7 reels you will win 2500 times your credit. The farming futures slot is very simple to use. The options in the screenshot above say it all – you can bet one(press that repeatedly to increase your amount to bet), bet max, spin and choose the amount you want to bet. You also have the option of stopping your spin whenever you want. The farming futures slot machine also offers autoplay. With autoplay you can select the number of spins from 5 to 500, and also the number of seconds between spins which is an excellent feature. For Autoplay stop settings, you have the choice of stopping when all spins are complete, or when a jackpot is won. You can choose to have the autoplay stop on any win, or if a win exceeds a certain amount, or if your credits increase or decrease by an amount that you choose. Overall the Farming Futures slot machine being 7 reels is a rather unique slot machine, and graphically it is very pleasant to play at. Unfortunately we do not have a Farming Futures Slot Machine flash game at this time, however you can check it out for free at Millionaire Casino. Where can I play the Farming Futures Slot Machine? As mentioned above, you can play the slot machine at any online casino that uses Vegas Technology software. If you are a big slots player then VIP Slots is a great option for you with an excellent rewards program for slots players. For more online casinos that use the Vegas Technology software, see our Online Casino Reviews section. 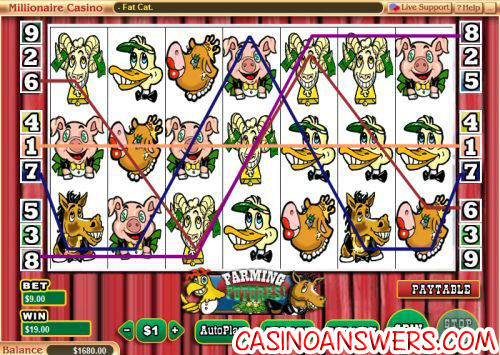 What is the best casino to play the Farming Futures video slot at? 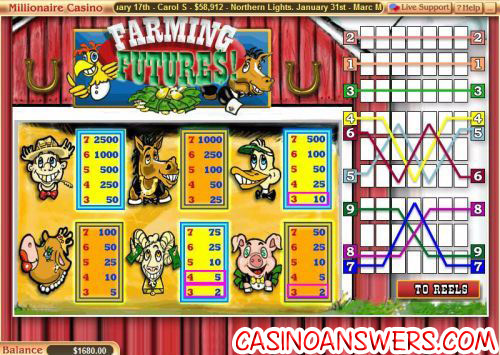 We recommend you play the Farming Futures slot game at Millionaire Casino and VIP Slots Casino. Where can I play the Farming Futures Slot? Are there any slot machines with 7 reels? What is a 7-reel slot? What are the payouts and paytables on the Farming Future slot?